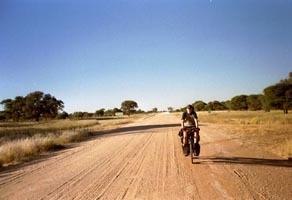 We choose Namibia because we liked to cycle in Africa. Namibia has savannes and desert nature, it also seemed to be an quite safe for African standards. We started with buying tickets from Amsterdam to windhoek. South African Airway could not ensure that the bikes we took with us will be delivered at windhoek international airport, we took the risk and in reality it was no problem at all (60 Euro per bike single way). 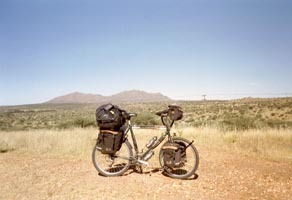 Namibia was a suitable country for exploring by bike. The people are mostly friendly, and the trafic in March/April was fare less dangerous than in New Zealand. The gravel roads where very good to cycle on the route we took. We cycled from Windhoek, Otjiwarongo to Swakopmund, with some extension now and than, in total 1070 km. Two time we rented a car, once to visit Etosha NP and the second time to visit the Sossosvlei. The funniest part is wild camping. Place your tent near a Windmill or hiding somewhere on a desolated gravel road. In the middle of no where it is the best opportunity to watch the stars and enjoy the milky-way. In the inlands you have to be prepared! You have to plan where you get food and water, because shops are not on the route, so take food for several day with you. We took food for 3 day with us. That is really great, to be totally independent. 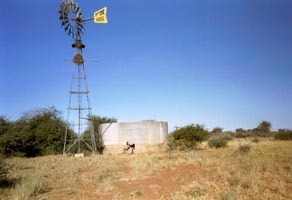 Don't think that you can find water in the rivers the are often dry, a good option are the windmills in the farm lands. The water quality can be tricky so a purifier is needed. During these 3 weeks we have eaten mostly pasta, cans with fruit/soup/meatballs, smashed potatoes, and in the small cities you can perfectly eat in restaurants and eat game. Good equipment is always a good start 26" bike with Shimano stuff on it. Special care should be taken for the tires. The gravel roads contains a lot of very sharp "doorns". We used Schwalbe double defence foldable tires and had 20 flat tires. So carry enough stuff with you to repair the punctures. You can expect heavy rain, wind and sun. So don't forget you suncream factor 35. A tropical hat is also very nice to protect your nose and ears.